Hi, first time poster here. I just recently picked up this Multi-Cart at a local game shop. It had two price tags on it; a $2 tag, and a $99 tag. The guy didn't know which was right so he gave it to me for $2. I brought it home and tested it right away, and it works great. I guess each combination of dip switches gives you a different game, though I have no way of knowing which combination will produce what game. I tried doing research on this cart, and I've brought it to a few game shop owners for more information, but all I've been told is that it's a homebrew multicart, and it's been estimated to be worth between $50-$100. I was able to find one other image of the cart that I have online, but it has no information to go along with it. Can anyone tell me more about this? If it's rare, how many may have been produced, who made them, value, etc. Thanks guys! 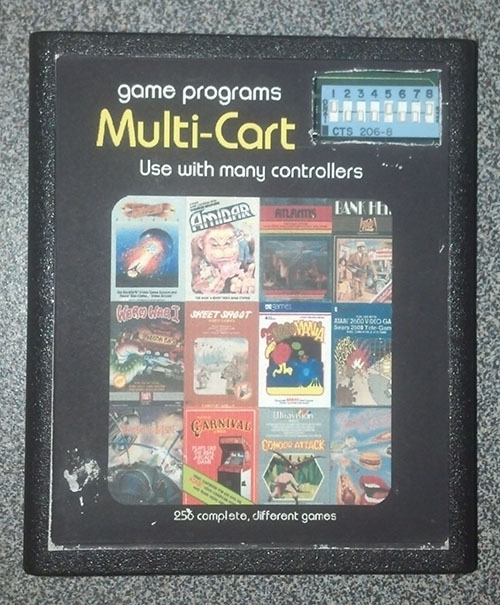 I think that's one of Sean Kelly's earlier 2600 multicarts, a steal for $2. "Use with many controllers" - I love it! Awesome find, regardless of its pedigree. I only ever find 2 or 4 game multicarts. "guess each combination of dip switches gives you a different game, though I have no way of knowing which combination will produce what game." I have same cart. I can send you a copy of the list, I'm at work right now I'll have wait on the list. Edited by walter_J64bit, Sat Jun 28, 2014 7:45 AM. Yep, believe that's a Sean Kelly cart as well. Great price for $2, but pretty obsolete as these things go now thanks to the menu-selectable Harmony cart. Here you go! Al is right it's an earlier 2600 multicart from Sean Kelly there was a second version silver label with an on screen menu you was able to send the dip switch version in to get the silver label multicart, its too bad that Activision told Sean to stop making the multicarts. Ive got multicart my too late so I've missed out on the silver label version, but I love using my dip switch multicart. Edited by walter_J64bit, Sat Jun 28, 2014 6:04 PM.